Haywards Heath manager Shaun Saunders said he ‘would rather be chasing than being the chased’. Horsham YMCA sit top of the Southern Combination Premier Division four points ahead of Haywards Heath, however Saunders admits this is a welcome situation. Heath finished top of the league last season only to have promotion snatched away from them after being deducted points for fielding an ineligible player. 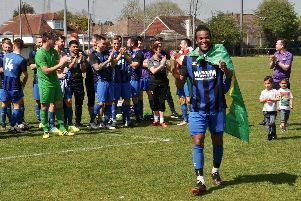 Saunders said: “About this time last season we were seven points behind Shoreham and we ended up winning it by about five points, so I’m pleased.